With the last of the lime plasters up on the bathroom walls on Monday and the exterior wrapped in a coat of blue lime on Tuesday, Ryan’s amazing, patient week of teaching was over. With all of the lime on the house finished, it seemed fitting to move away from our practical education in inorganic chemistry and on to something more organic. On Thursday morning Kaki, a local natural builder, invited us over to her place to walk us through the process of making milk paint. Milk paint is a great, natural alternative to latex paint and is what we have chosen to cover the ceilings. The first step in making milk paint is making casein glue. Casein is a protein found in milk, and is separated from the milk as it curdles. One way of doing this is to add vinegar to the milk, as the acid causes the strands of protein to clump together. In our case, however, Kaki used raw milk that had been sitting outside in the heat for a few days and had curdled on it’s own. I was a bit apprehensive at the idea of having anything to do with a five gallon bucket of curdled milk, but it was really more like working with five gallons of cottage cheese. We even tasted some before blending the curds with borax and water! Once the casein has been separated from the milk in the curdling process it isn’t very water soluble so the high pH of the borax helps to redissolve the the molecules. 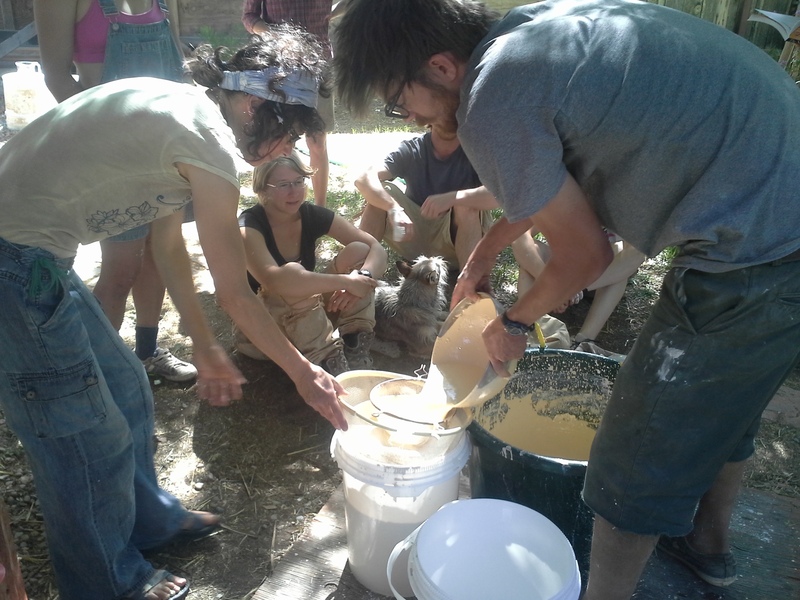 We mixed the casein glue with lime, powdered clay, and pigments to make a smooth, butter yellow paint. When we painted it onto the drywall ceiling it went on pretty much just like any commercial paint from a tin, but with a distinctly dairy smell. Don’t worry, the smell disappears when the paint dries! If that wasn’t enough science for one week, Kim Sherwood came to talk to us one lunchtime about his work with micro-organisms and how they can be used to improve the performance of adobe floors. I had always been lead to believe that the fewer living creatures found on your floor the better, but apparently this is not always the case. Kim explained to us how he makes use of naturally occurring communities of bacteria and single celled organisms called archaea. These communities, found all over the world in soils and ponds, use iron as an energy source, variously chewing it up and pooping it out to leave a durable, iron-rich layer on the surface of adobe floors when they dry. The activities of similar communities of microbes has been suggested as one explanation for the formation of desert varnish – the slick dark layer that you can see on the sandstone faces that surround Moab. Although scientific opinion seems divided on this explanation, there is something nice about the idea that the floor we are making could have something in common with the cliffs around us. The dried samples of the mud that Eric made a few days ago certainly look a lot like varnish, and at any rate, they are impressively hard and resistant to dents and scratches. It looks like we will be going ahead with the experiment! Next Post Welcome Home Lorenzo! Painting the ceiling and covering the floor…. using SCIENCE, with Community Rebuilds!